This video will start by showing you a quick comparison of alkene halogenation versus aromatic halogenation: bromination and chlorination. This video will show you the aromatic halogenation mechanism from the role of the Lewis Acid catalyst and formation of the super-electrophile, through the entire mechanism of adding halogen to benzene. Also shown is a break down of the reaction mechanism for aromatic halogenation using Cl2 with the Lewis acid catalyst AlCl3. 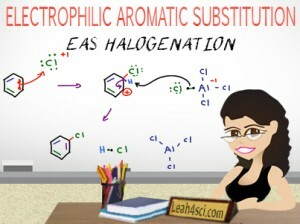 This is Video 3 in the Electrophilic Aromatic Substitution Video Series. Click HERE for the entire series.